World Skin (1997) by Marice Benayoun. World Skin is an interactive artwork presented for the first time at Ars Electronica (Linz, Austria). It won the Golden Nica Award in the Interactive Art category in 1998. Armed with cameras, we are making our way through a three-dimensional space. The landscape before our eyes is scarred by war-demolished buildings, armed men, tanks and artillery, piles of rubble, the wounded and the maimed. This arrangement of photographs and news pictures from different zones and theaters of war depicts a universe filled with mute violence. The audio reproduces the sound of a world in which to breathe is to suffer. Special effects? Hardly. We, the visitors, feel as though our presence could disturb this chaotic equilibrium, but it is precisely our intervention that stirs up the pain. We are taking pictures; and here, photography is a weapon of erasure. The land of war has no borders. Like so many tourists, we are visiting it with camera in hand. Each of us can take pictures, capture a moment of this world that is wrestling with death. The image thus recorded exists no longer. Each photographed fragment disappears from the screen and is replaced by a black silhouette. With each click of the shutter, a part of the world is extinguished. Each exposure is then printed out. As soon as an image is printed to paper, it is no longer visible on the projection screen. All that remains is its eerie shadow, cast according to the viewer’s perspective and concealing fragments of future photographs. The farther we penetrate into this universe, the more strongly aware we become of its infinite nature. And the chaotic elements renew themselves, so that as soon as we recognize them, they recompose themselves once again in a tragedy without end. We take pictures. First by our aggression, then feeling the pleasure of sharing, we rip the skin off the body of the world. This skin becomes a trophy, and our fame grows with the disappearance of the world. an upcoming game about snapping virtual budgies doing cute and silly things to share online. Look, that one’s riding a Roomba! That one’s rolling around in a toilet roll tube! That one’s hopping about the sink! That one- wait, is that one carrying a knife in its beak? Adorable! See these birds and more in the trailer below. As we take photos of our cute friends and share them, our follower count grows (obvs) and we can unlock special rare birds. I am reminded a wee bit of Neko Atsume: Kitty Collector, but mostly I’m not thinking much about anything, just enjoying watching those birds. Google Street Car (Linus Suter, 2011) is kind of a mix between playing GTA and pretending to be Jon Rafman collecting images for Nine Eyes of Google Street View. Kaja Fuchs has restaged the seminal photographic works of Bernd and Hilla Becher in Minecraft, collaborating with her sister who built the models in the game. all images © Kaja Fuchs 2019. A Brand New Camera (Fernando Ramallo, 2018). Thank you for your purchase! You are now the owner of a brand new Digital Still Camera. Explore and capture your surroundings with the future of digital imaging. 320×240 resolution with 128 shades of luminance. 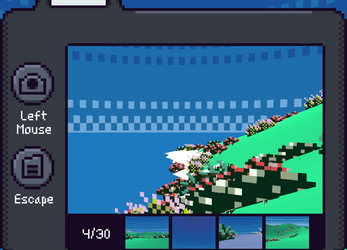 IslandPop Photo is a photography game and walking simulator heavily inspired by the City Pop era and the works of Hiroshi Nagai. 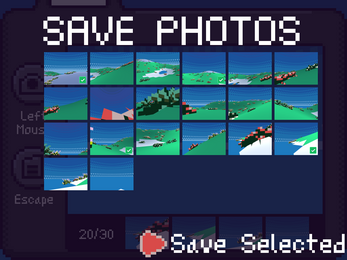 Explore procedurally generated islands with your camera to take photos and save them to disk. You’ll walk about Black Rock City, site of the Burning Man festival, and try your best to re-create some photos. Identify the landmarks in the photos, find the right place to stand, and choose just the right angle. The city layout, camps, and landmarks are all procedurally generated. 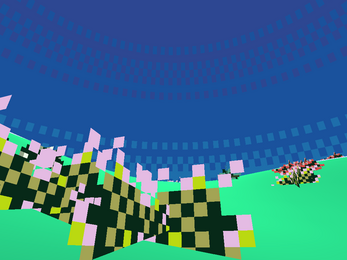 It’s a first-person shooter in which you shoot photos.